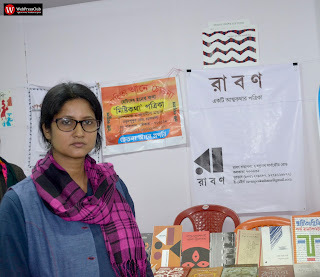 Our Correspondent ● Kolkata: The Eighteenth Little Magazine Fair and Literary Festival, organized by the Paschimbanga Bangla Academy in association with the Information and Cultural Affairs Department of the Government of West Bengal, has kicked off through a brief inaugural ceremony at the Nandan-Rabindrasadan complex on 11 January. 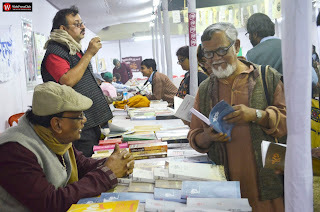 Minister of Education of the state Partha Chatterjee, along with veteran writer Atin Bandyopadhyay have formally inaugurate the fair this year. Aditya Mandi, Uday Thulung were present at the occasion as the hounourable guests. President of the Academy Shaoli Mitra and other dignitaries like poet Joy Goswami etc were also there to embrace the occasion with joy. It all began with a fakiri song performed by renowned artist Golam Fakir. This year the fair is accommodating nearly 400 stalls to various little magazines, coming from not only Kolkata and suburb but also from remote corners of the state. Over 300 poets and writers are participating in several literary sessions in this six-day event. Awards for literary excellence have been also given away to 11 writers and poets and couple of little magazines and one editor. Lectures by famous faces like Nirsimha Prasad Bhaduri, Hiran Mitra and Suman Chattopadhyay have been also delivered regularly. Stall owners are quite happy with the overall arrangement and they say that they are doing reasonably good business this year. Most of them also thanked the organisers for arranging cultural programmes every evening. Famous artists like Rezwana Chaudhury Bannya and Golam Fakir and Bengali band Lakkhichara have been performing live there. Apart from celebrating and promoting new talents through little magazines the fair also spreads the message of true friendship and harmony. Amid this intolerant air the fair hopes to bring a sense of life and peacefulness everywhere.